Arsenal manager Arsene Wenger has revealed Olivier Giroud would likely end up wearing the goalkeeper gloves in an emergency if Petr Cech was unavailable. 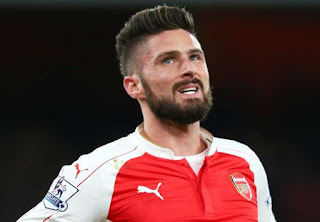 The latter has been superb betweent he posts for Arsenal this season, but Wenger feels striker Giroud could go in between the sticks if the former Chelsea custodian got sent off and he had used all his substitutes. "Who would go in goal if we got a goalkeeper sent off? That would give me a big problem, because I haven't thought about it. Usually it's the central defenders or the strikers," Wenger told Arsenal's official website. "I had George Weah at Monaco and he was a fantastic goalkeeper in training. Maybe a guy who has played basketball in his youth would be good, he would be used to using his hands.